White House see-saw: The week started with White House Chief of Staff Rahm Emanuel signaling that President Obama would be willing to negotiate over creation of a government-run health insurance plan. Mr. Emanuel said one of several ways to meet the president's goals would be to have a public plan as a fallback if the marketplace fails to provide sufficient competition on its own. He told The Wall Street Journal that he believes it is more important that health care legislation inject stiff competition among insurance plans than it is for Congress to create a pure government-run option. The pushback from Democrats on Capitol Hill was instantaneous. Soon after, the president took the unusual step of issuing a statement from Moscow correcting Emanuel's statement and reinforcing his commitment to the government plan. Reid backtracks: Senate Majority Leader Harry Reid returned from the July 4 recess to say that attempts to reach a bipartisan agreement on reform were slowing things to a crawl in the Senate, and he basically ordered Democrat Senate Finance Chairman Max Baucus to proceed without his friend and colleague, Republican Chuck Grassley. Politico reported that Reid told Baucus that his concessions to create a bipartisan bill could cost 10 to15 Democratic votes. Sen. Reid's "no bipartisanship statement" was like a screeching left turn for a car speeding down the highway. Going back to the drawing board would make his goal of a Senate vote on final legislation before the August recess even more difficult. Then Reid backtracked, meeting the next day with four Republican senators, including Sen. Grassley, who now are back at the table negotiating a deal. Hospitals balk: Next, representatives of major hospital associations released an agreement with the White House to save about $150 billion over 10 years as their contribution toward the reform effort. But almost immediately, individual hospitals began organizing, saying that the deal doesn't speak for them. Two public hospital systems who didn't participate in the talks said reductions "could severely damage" hospitals that serve the poor. "Everyone can say we need to reform the system," one hospital official said. "But when you start to look at the details of how you do that, that's when you get the rats scurrying off the ship. That's what's happening now." No deal: Rep. Henry Waxman, chairman of the House Energy and Commerce Committee, said he was not bound by an $80 billion deal announced by pharmaceutical companies last month to reduce Medicare prescription drug costs for seniors. The deal, struck by Baucus and leading pharmaceutical companies with the participation of the White House, includes a provision to narrow the gap in coverage (the "doughnut hole") with payments from the drug companies covering up to 50 percent of the cost of brand-name medicines in Medicare's Part D prescription drug program. In exchange, the government would agree not to apply Medicaid rebates (i.e., higher taxes) to Medicare prescription drugs. But Rep. Waxman told reporters, "We're certainly not bound by that agreement. The White House was involved, and we were not." The additional rebates would cut deeply into the money the companies would spend on research and development, compromising innovation and future medicines. Tax cap: Sen. Reid also took off the table the idea of capping the tax exclusion for employment-based health insurance as a way to help pay for the reform effort. An excellent piece by Len Burman in today's Washington Post explains why the cap would actually be a good deal for labor unions, most of whom are vociferously opposed to it. Who decides on care? The Washington Post carried a front-page article on Wednesday entitled, "In retooled health-care system, who will say no?" about growing concerns over government involvement in deciding what health care Americans will or will not receive. A new 15-member council of government officials released a report on June 30 with its recommendations on comparative effectiveness research. The Post article quoted a neurosurgeon who questioned Mr. Obama at the ABC News White House forum last month, wondering who would enforce limits on care. "President Obama called it the 'right question' — then failed to answer it," the Post reported. The Wall Street Journal had an excellent editorial on Tuesday, "Of NICE and Men," about the dangers of government control over medical decisions. osite is true. Elmendorf said, "This bill will add substantially to the long-term spending burden for health care on the Federal government." This appears to pose a significant problem since President Obama said in his most recent press conference, "And I've said very clearly: If any bill arrives from Congress that is not controlling costs, that's not a bill I can support." One Hill staffer noted that, with CBO's clear statement, it doesn't appear that President Obama could support the legislation making its way through the Senate HELP committee. Remember our 80-20 rule. Most of those in the health sector are willing to go along with 80% of the agenda, but they are fracturing over the last 20%. NPR reports that the House may very well get a bill to the floor for a vote by the end of the month, but if the Senate doesn't pick up the pace soon, chances for a final bill by the end of the year will start to dim considerably. Supporters of sweeping health reform often cite isolated answers to opinion polls to show public support for their initiatives, but a more comprehensive analysis of the surveys shows that, while Americans do believe that health reform is crucial, most are concerned about government tampering with their coverage, digging into their wallets, and increasing the public debt, writes Turner. A recent Wall Street Journal/NBC news poll found serious concerns about government red ink. Americans also are wary of the government disrupting their current coverage or raising taxes to finance reform. A recent New York Times poll found that more than three-fourths of respondents were satisfied with the quality of their own medical care. And only about four in 10 were willing to pay $500 or more in taxes annually to finance an overhaul of the health system. Similarly, a Washington Post/ABC News poll from late June found that most people are "very concerned" that legislation could cause "higher costs, lower quality, fewer choices, a bigger deficit, diminished insurance coverage and more government bureaucracy." The idea that large numbers of Americans are declaring bankruptcy due to medical expenses is a myth, and creating a government-run health insurance plan in the U.S. will do nothing to reduce personal bankruptcies, according to a study from the Vancouver-based Fraser Institute. Advocates of socialized medicine argue that the mixed public-private health insurance system in the U.S. causes many Americans to become financially bankrupt, and that this would not occur if the U.S. adopted the Canadian health system. Yet the most recent data (2006 and 2007) shows that personal bankruptcy rates are actually higher in Canada (.3% for both years) than in the U.S. (.2% and .27%). Research also indicates that medical spending was only one of several contributing factors in 17% of U.S. bankruptcies, and that medical debts accounted for only 12 to 13% of the total debts among American bankruptcy filers who cited medical debt as one of their reasons for bankruptcy. Harris, Stevens, and Morris describe the ballooning problem of counterfeit and substandard drugs in less developed countries, which result in unnecessary death and increased levels of drug resistance. Fake tuberculosis and malaria drugs alone are estimated to kill 700,000 people a year, they report. Current attempts to deal with the problem through tougher regulation and criminal penalties do not address the root causes of counterfeiting. The solution must be to enable purchasers to distinguish between what is real and what is fake, write Harris et al. In the short-term, the private sector should take advantage of its innovative capacity to experiment with various technological solutions that enable it to protect the identity of its products. Governments, meanwhile, should reduce those interventions which undermine the supply of quality drugs, such as taxes, tariffs, price controls and other arbitrary regulations. Before America emulates the Canadian model with a new trillion-plus-dollar health plan, it's worth examining whether government-run systems are all they're cracked up to be, writes Pipes, who was born in Canada. A "culture of queuing" dominates Canada. In 2008, the average Canadian waited 17.3 weeks from the time his general practitioner referred him to a specialist until he actually received treatment, according to the Fraser Institute. That's 86% longer than the wait in 1993, when the Institute first started quantifying the problem. In 2008, more than 750,000 Canadians — 2.8% of the population — were on waiting lists. Both Canada and the United States spend ever-greater amounts on health care, but the two nations part ways when managing those expenditures. In the U.S.'s decentralized system, payers compete to drive the hardest bargains with health care providers. In Canada's system, provincial governments dictate what will be spent using global budgets. Our neighbor to the north provides a glaring example of what government health care looks like, concludes Pipes. inks is that they add empty calories that increase obesity and drive up medical costs, which raises the cost of federal health programs, and boosts health costs as well. This proposal is bad economics and bad science, writes Entin. The correct remedy is not to tax food and drink that hundreds of millions of people consume without becoming obese. The remedy is to impose more of the related health care costs on the individuals who have failed to take care of themselves. We should encourage risk-adjusted premiums, deductibles, and copayments for health insurance, rely more on private insurance and health savings accounts, and have less government subsidy of medical care. Many advocates of a public health plan claim that it will save money compared to private health insurance because Medicare has lower administrative costs than private insurance. However, on a per-person basis Medicare's administrative costs are actually higher than those of private insurance. In 2005, Medicare's administrative costs were $509 per primary beneficiary, compared to private-sector administrative costs of $453. In the years from 2000 to 2005, Medicare's administrative costs per beneficiary were consistently higher than that for private insurance, ranging from 5% to 48% higher. This is despite the fact that private-sector "administrative" costs include paying state premium taxes, from which Medicare is exempt, plus the cost of non-claim health care expenses, such as disease management and on-call nurse consultation services. Contrary to the claims of public plan advocates, switching the more than 200 million Americans with private insurance to a public plan will not save money but will actually increase health care administrative costs. 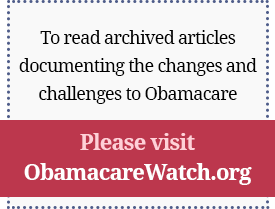 The Heritage Foundation has released several papers on health care reform. Click here for their latest research. The Obama administration is promising to wring massive savings out of the health care industry, writes Rove, former senior adviser and deputy chief of staff to President George W. Bush, but the savings are at best an aspirational goal. For example, the administration is strong-arming health care providers into promising nearly $2 trillion in health savings. It got pharmaceutical companies to promise to lower drug prices for seniors by $80 billion over 10 years. The administration also trotted out hospital executives to say that they would voluntarily save the government $150 billion over 10 years. These savings are a mirage, but by the time the real price tag emerges, it will be too late to do much more than raise taxes and curtail spending on urgent priorities, writes Rove. Mr. Obama has already created a river of red ink. His health care plans will only force that river over its banks. Federal Medicaid payments to the states have long been based on a formula that calculates a Federal Medical Assistance Percentage (FMAP) for each state based on its per capita income. But the formula is quite skewed in favor of high-income states in that it does not adequately compensate for the dual fact that low-income states have both greater need for assistance and lower fiscal capacity than higher-income states, write Grannemann and Pauly. In fact, the poor calibration of the current matching formula may well have contributed significantly to the lower Medicaid eligibility and benefits we observe in the lower-income states, primarily in the south and the west — and to the higher rates of uninsurance we see in those states. Granneman and Pauly suggest a method for computing Medicaid matching rates in a way that meets criteria for equity across states, for both the poor who benefit from the program and for the taxpayers who provide the funding. Equal-burden-for-equal-benefits matching rates would enable each state to provide a specified level of benefits while spending no more than any other state as a percentage of taxpayer income on the state share of Medicaid. Congress should follow the example of Tennessee Governor Phil Bredesen, writes Matthews. The governor worked with health insurers to create a minimum-coverage plan called CoverTN in 2006. The plan has a maximum payout cap of $25,000 a year. Premiums are split three ways between employer, employee and the state. Current rates range from $38 a month (the individual share of the premium) for a non-obese, non-smoker under age 30 to $79 a month for someone age 60 to 64. Such plans can be constructed to provide several physician visits a year (12 under CoverTN), ample preventive care with physicals and mammograms, low co-pays on generic drugs, and still have funds left over to cover some hospital care if needed. But the most important point is the plan is affordable for individuals, employers and the state. CoverTN only cost the state $11 million last year — less than a rounding error in the trillion-dollar-plus cost estimates Congress is considering. Scoring Savings: How Can Quality Improvement Reduce Health Care Costs? Monday, July 13, 2009, 12:15 p.m. – 2:00 p.m.
Wednesday, July 15, 2009, 9:00 a.m. – 11:00 a.m.
Wednesday, July 15, 2009, 12:00 p.m.
Wednesday, July 15, 2009, 12:00 p.m. – 1:00 p.m.
Friday, July 17, 2009, 8:30 a.m.
Tuesday, July 21, 2009, 7:00 a.m. – 9:00 a.m.